[prMac.com] Vilnius, Lithuania - Jumsoft, a developer of high-quality applications and designs for OS X, is further extending its product selection with the new Infographics for Pages app. 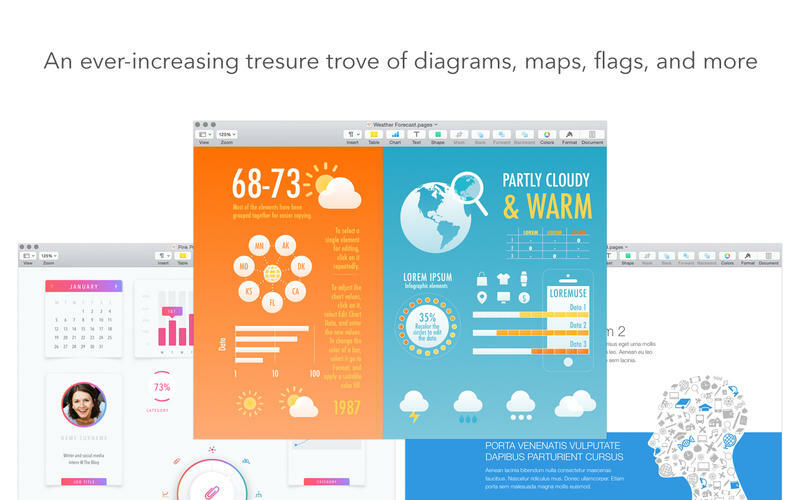 It's been adapted from one of Jumsoft's best-sellers, Infographics, which was originally designed for Keynote. The new version offers over 2,000 diagrams, maps, and other visualization elements. The items included in the Infographics set range from smart and modern diagrams to national symbols and maps. Whether users are preparing a report focused on a particular country, explaining the intricacies of an industry, or presenting annual financial results, Infographics has a go-to supply of quality visualization tools. Although the set is designed for Apple's Pages, the images can also be pasted in Keynote, Numbers, or iBooks Author. Algirdas Unguvaitis, the general manager of Jumsoft, said, "There is huge demand for quality data visualization elements in media, marketing, web design, and many other industries. The Keynote version of Infographics has been one of our most popular products since the day it launched, and now we're happy to introduce the Pages version." All images included in the Infographics set have transparent backgrounds that allow them to be placed on various colored and patterned backgrounds. Most elements are drawn in shapes, which enable resizing and changing colors as well as adding and removing various image components. Infographics for Pages 2.7 is offered at the introductory price of $14.99 USD (or equivalent amount in other currencies) and available worldwide exclusively through the App Store in the Graphics & Design category. The set is also included in Jumsoft's Toolbox for Pages and Toolbox for iWork apps. More information and design samples are available on the Mac App Store. Based in scenic Vilnius, Lithuania, Jumsoft is a privately funded company founded in 2002. Committed to providing the highest quality software, Jumsoft is a dedicated group of Apple Macintosh experts whose goal is creating and marketing exciting, easy-to-use and powerful applications for the Mac Platform. Jumsoft most recently focused its attention on maximizing the potential of Apple's iWork, quickly becoming the leading provider of Keynote themes and objects. Copyright 2002-2016 Jumsoft. All Rights Reserved. Apple, the Apple logo, Mac OS X and Macintosh are registered trademarks of Apple Computer in the U.S. and/or other countries.